You are on your way to creating content and tweets….but how do you grow your following? The next step is to begin finding followers and growing your account. Simply tweeting and producing content is not enough…you must have a strategy to grow your following. In this video, I will tell you step by step what to do to find relevant followers that will grow your business. [Speakeasy Vlog] - What Should Your Business Tweet on Twitter? Not sure what to tweet for your business? Watch this video. You have started a Twitter account…..now what? The next step is to start tweeting! No one wants to follow an account that has nothing to say or adds no value to them. In this video, I will tell you what are some starting topics and inspiration for what to tweet for your business. So you have created a Twitter account....you are posting all the time.....yet you feel as if you are tweeting into space and/or no one is following you? You are NOT alone. Most small business owners know that social media is important, yet when it comes down to executing a strategy and gaining a following most businesses fall short. Now we can get into the ins and outs of all social media, but today I want to focus on Twitter. No matter how sound your content strategy and your consistency of tweeting....unless you are a large brand or celebrity, the likelihood that you will gain a large following is slim to none unless you have a Twitter follower growth strategy. First let's take a look at what NOT to do when trying to grow your Twitter account. Do NOT pay for followers. As you have probably noticed there are many services that claim they can bring you thousands of followers instantly for a few dollars. Do NOT fall for this ploy. Twitter frowns upon those that use this strategy and Twitter can potentially suspend your account for this as it violates Twitter's policies. Also, there are services like Fake Follower Check that have a free service to see what percentage of fake followers accounts possess. You can see from my example below of my account and one of my followers that clearly has many "fake" followers. Do NOT follow large numbers of people at one time. Twitter has a limit of following more than 2,000 followers until you have at least 2,000 people following you. This prevents people from becoming overly spammy and forces people to grow an actual following. Although this feature can be frustrating to some, it really is for the benefit of Twitter users. Do NOT have services autopost content for you. Now granted...having connected services seems like a HUGE time saver, but most of the time these features can hurt your account more than help it. One classic example of this is connecting your Facebook account with your Twitter account. Although this seems great, most of the time when you post on Facebook to Twitter you are not thinking about 140 characters and your message will almost ALWAYS get cut off. People on Twitter do not want to be navigated back to Facebook....they are on Twitter for a reason and it is not to be directed to Facebook. Also...one of the most annoying features of this is when you upload photos on Facebook, your account will autoposts to Twitter not with a description of the photo but the phrase...."I just posted a photo on fb..." This is not exactly professional. You can see in the example account used earlier that this account is connected to numerous autopost services. When most of your tweets are clearly autoposts, most will think this is not legitimate account but is being run by bots. Follow those that follow you (with the exception of spammy accounts). Follow users who are in your target market. Follow accounts slowly and not in large batches. These keys will help get you started on the Twitter success train. Don't have time to manually follow people or manage a growth strategy? Read my case study below on how Speakeasy can help! The following are real results of a few of my clients during a 90 day time period. These clients are in various industries ranging from weddings, food, and business service industries. All of these accounts are being grown by my own Speakeasy Twitter Follow Strategy. Now unless you are a large celebrity, you will not get a large following overnight as explained earlier. The followers of the examples below have been strategically targeted to meet the needs and goals of each client. It is better to have a smaller following of those dedicated to your brand that will bring in sales, as opposed to a large following that is not your target and will not bring cash in your door. The results above are for clients in various industries and results do vary. Does NOT pay for followers. Our following strategy is done manually and no auto bots are used. Our strategy gains you followers who are your target. You have control of your content, we will not tweet as you, but will simply grow your following on the back-end. Results are a GUARANTEE! 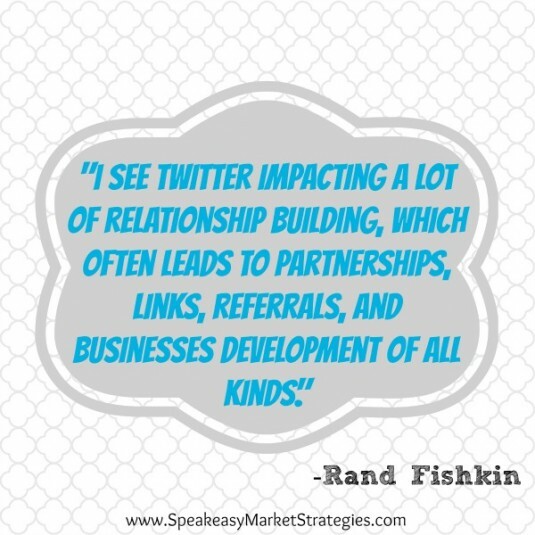 On average Speakeasy clients received between 100 to 200 targeted followers each month. Who's ready to get started today? For just $75 per month you can get results. Click here to contact me, shoot me a tweet, Facebook message me, or any of the many ways to get ahold of me as you can see below. You will not get the results you want if you do nothing....so contact me today! Don't think social media has an impact? Tell that to my viral tweet! Don't think social media has an impact? 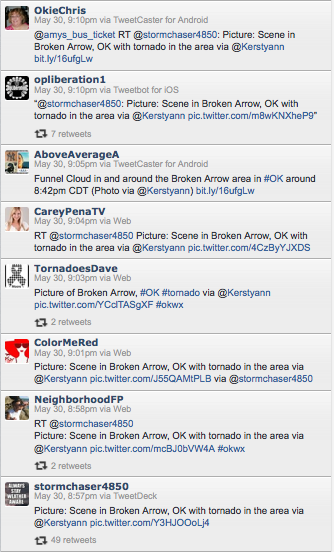 Tell that to my tweet that went viral last night from the tornado in Broken Arrow. As many of you know...Tulsa, OK made national news last night for the tornadoes. Oklahoma is in the spotlight now in light of the recent devastation in Moore and OKC. Tulsa is my home and when I heard of the tornado heading our way I packed up my laptop, iPad, and my dog and headed for my friend's house. At the time this was a great idea for the storms were not near her neighborhood. But as you will see from my photo, we were right near all the tornado action. Many people do not think social media has an impact, but you can see countless examples of social media giving the inside scoop to national disasters like the OKC/Moore tornado and the Boston Marathon. Not thinking my image would take flight, I posted it on my personal account for my followers to see. Within minutes my image was being retweeted by storm chasers and I was receiving tweets and even a phone call from NYC from CNN's Anderson Cooper's 360 news show. Now looking at my tweet it may not seem that it went viral, but it only takes the right people for you to see a huge impact in your social media. From the 7 and counting retweets it received, the photo was on CNN and other new stations shows and websites within the hour. My tweet was also changed many times and other people's tweets were then retweeted....creating more virality. Now there are countless examples of virality on social media and me having my own personal story continues to prove the point that social media has IMPACT. Simply by being involved in a trending conversation on Twitter allowed me to have my image featured on national news and had people calling me from all over asking if that was my image on the news. So how can we translate my example to your business? You cannot go viral if you are not in the game. If you do not have a Twitter account for your business, let alone yourself, get one. In order for you to get noticed and potentially go viral, you need to tweet things that are interesting and unique. For my example I tweeted what was big news in my city and it happened to go viral because I pushed the button and it was a hot topic that people were reading in real-time via Twitter search. Know what events and what is trending in your field. Knowing what is going on is half of the battle. After listening to what are the hot topics that are trending and relevant to your business giving the input, act on the trend. Send a tweet, allowing you to take part in the conversation. With social media you never know, you could end up on CNN. Just like anything viral, seeing my tweet on the news was totally unexpected, but again it would not have happened if I did not hit send on my tweet. I encourage you to being participating in Twitter for your business and listening to the trends that are relevant for your customers. If you have read this article and need help with Twitter feel free to send me an e-mail at Kersten at Speakeasy Market Strategies dot come. I do also have social media management programs available for those that need Twitter, but would like someone to manage it for them. Here are a few Vine videos I took prior to the funnel cloud appearance. Let's be honest, Twitter lingo can be extremely confusing, especially if you're a newbie! Below are some terms that every business on Twitter should be familiar with. This is your username. For me my "Twitter Handle" is @SpeakeasyStrat. This is the name that you have chosen to represent yourself, your company, or brand. When selecting it initially, you want to make sure that it represents what you are trying to market well. You want people to be able to easily communicate with you, so keep it simple. "To Follow" is an action you take on Twitter to follow another Twitter user. When you "follow" someone, you are saying you wish to follow their updates aka tweets. You can do this by clicking the "Follow" button on a users Twitter profile. Once you have followed a Twitter user, their updates will appear in your Twitter homepage so you can stay updated on that user's tweets. A follower on Twitter is simply another Twitter user who wishes to follow your tweets. When you follow a user, you are finding someone you are not following to stay up to date on them, but what about those that wish to follow you. When a Twitter user is interested in staying up-to-date with you they will follow you. On your profile you can see which Twitter users are following you as well. You can click on the "Followers" number on your profile and not only see who is following you, but you have the ability to follow them back with the click of the "Follow" button. Following back all, some, or none of your followers is a debate among marketers. Some do not want their homepage to get cluttered and others do not want to take the time to follow back people. My opinion is that if someone has taken the time to follow you, show the same courtesy. On that, do not follow back spam accounts or those that have explicit content. I like to organize my followers into lists typically....but we will get to that further down. A Twitter stream is a list of a users tweets in real-time. For example, every time I tweet, the tweet goes into my Twitter stream and people can see my entire stream by visiting my profile page. Your homepage Twitter stream shows the tweets of people you are following in real-time. When you see an "@" symbol before a twitter handle it means that a user is sending a public message to another Twitter users. "@" Replies do not show up in a users stream. This feature allows you to interact and have conversation with other Twitter users. If you see the "@" symbol within a tweet and not that the beginning, it means a user is wanting the message sent out to appear in their Twitter steam. A direct message is a private message sent between users. A direct message can only be sent to users who are currently following you. You can DM someone by clicking the “message” link on their profile or typing D USERNAME within a status update. Probably one of the more confusing Twitter concepts is the hashtag, but it is the BEST resource for Twitter. A hashtag is a way Twitter tags conversations around a certain topic, event, or theme. Anyone can create a hashtag by combining the "#" symbol with a word, acronym, or phrase (with no spaces), which creates a tag within your tweet. If you are having an event you can create a hashtag and those attending the event can include the hashtag within their tweet to show that the tweet related to the event. You can then search for the hashtag within Twitter's search options to see all the tweets about that hashtag in real-time. Here is an example from an event I attended earlier this year. As you can see from my image above, there are a few tweets within my Twitter stream from other users, these are tweets that I retweeted. A retweet is when you wish to repeat something someone else has tweeted. Use this feature to use something valuable someone has said that you also wish your followers to view for every time you retweet the update shows up within your Twitter stream. These are tweets that are Twitter's form of advertising, similar to Facebook's "Sponsored Stories." For those of you that have a vast Twitter Vocabulary, take a look at the infographic below for even more in-depth vocabulary words. For those of you still slightly confused about Twitter, feel free to send me your questions or ask them in the comment box below. Who Should Your Business be Following on Twitter? So far I have taught you whether you should be tweeting as a business and how to maximize your tweets. Now I am going to discuss who you should be following as a business. 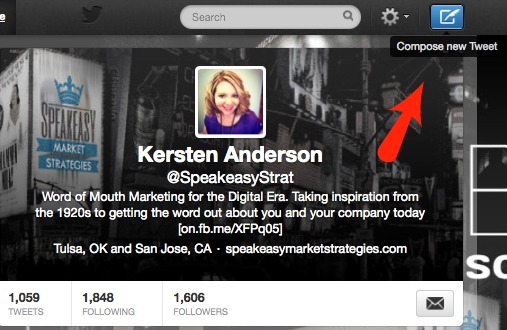 Now when you "follow" someone on twitter, their tweets are show in your Twitter stream. Through their tweets you can learn more about your followers. It is through this insight from your followers that you are able to learn about your brand advocates and build an ever stronger loyal customer base. When you first sign up for Twitter, you may have noticed a feature that suggested to you who to follow. Even after you have finished your initial Twitter set-up, you can still access this feature from your Twitter stream on the left-hand side in the widget called, "Who to Follow." You can choose people in certain categories as well and it is recommended to follow people who are experts in your field. As expressed in the section above, following experts and thought leaders in your industry is vital for your Twitter following. Not only does it give you credibility that you know who are the experts in your field, but it also gives you the chance to learn more about your field. These experts will also be a valuable source of content to pull from and to retweet later. I am a large advocate of utilizing Twitter lists as well, which is why I suggest when you follow "thought leaders," that you create a Twitter list showcasing your experts. If your Twitter following becomes extremely large, using the list of organized experts will come in handy when you want to grab quick content. Twitter Search is akin to Google Search for Twitter. It allows you to look for certain people, topics, and phrases. The results will show you people whose description match the words you entered and people who have recently tweeted with the words you searched for. This tool is fabulous to find people who are potentially tweeting about your product, service, or industry. You have have seen large events having a certain hashtag for events around the globe. A perfect example of this would be the Social Media Marketing Wold Conference I attended back in April. The event hashtag was #SMMW13 and when people attending the event were tweeting about the event, things people said, or observations they would type the hashtag. You can search and follow hashtags so you can see what is happening at the events in your Twitter stream. Chances are if you are attending or are interested in a large event, that the people attending or tweeting about it have something in common with you. These are the perfect people to follow. You that is slightly confusing, but look at the people you are following and see who is following them. If you have taken the time to follow an expert or someone whose tweets you like, go ahead and see who they are following and then follow those people as well. Don't follow too many people at once. According to @Hubspot, a best practice is to not exceed following more than 25 to 50 people per day. There is a lag time between when you follow someone and when they follow you back. You do not want your Twitter ratios to be offset by you following large numbers of people at one time and having a small amount of people following back. Follow those that are following you. If people have taken the time to follow you, go ahead and follow them back. This makes you seem approachable and relatable to your following. Obviously do not follow back people who appear to be spammers. These basic tips should get you started on "Who to Follow" on Twitter. Always think about your business strategy when you are following people on Twitter. If you are wanting to project expertise, follow the other experts and people wanting advice from the experts. If you need any help with your social strategy and Twitter, feel free to contact me at Kersten at Speakeasy Market Strategies dot com or leave a comment below. Don't forget to tweet at me at @SpeakeasyStrat . If you have read this article and need help setting up your new Twitter Business Account feel free to send me an e-mail at Kersten at Speakeasy Market Strategies dot come. I do also have social media management programs available for those that need Twitter, but would like someone to manage it for them. Now that you are on Twitter....What should you tweet about? Is your Twitter account a customer service platform? Who are you targeting with your Twitter account? Do you have a content strategy for your account? How will you use Twitter differently than your competition? Once you have settled your strategy for your account, it is time to start planning out your tweets. It is always recommend that you plan them out in advance so you strategy is fully executed. Discuss with your company upcoming events and promotions that can be included in your upcoming tweets. You can tweet photos or a status about what is happening around the office. This is a great way to showcase your company culture. If your company is attending an event or holding a webinar, tweet about it. Share the link to the event or use the event hashtag. A great personal example of this was when I attended the Social Media Examiner Marketing World Conference, known to the Twitter world as #SMMW13. Anytime something I deemed relevant to my followers and was happening at the event, I used #SMM13 within my tweet. Twitter uses hashtags (#) to be able to easily find trending topics and allows people to have a conversation about a certain topic, which is the perfect platform for event marketing. Do you have a blog for your company or any recent press? Link to the content within your tweet. In the tweet, give people a reason to click, so make sure your tweet has an interesting or eye-catching update to go along with the tweet. On your website you can see how much traffic you gain from tweets that are linked to your website content through your back-end stats like Google Analytics. Do you have experts that you follow for your industry? Tweet their blogs and articles. Be sure to let your followers know why they should read it or why it is relevant to them to click. Besides pasting an article in a tweet, you can also "retweet" what someone else is already saying on twitter. Then you "retweet" the tweet that was sent not shows up in your newsfeed for your followers to read as well. Retweeting is essentially an avenue for digital content to go viral. Twitter is one of the most conversational social media platforms, so why not talk to other users. You can tweet directly to people by including the "@" symbol and then their twitter name. For example if you wanted to tweet at me you would include my name @SpeakeasyStrat within the tweet. There are 2 things to remember when including a person in a tweet. First is that when you tweet beginning with the person's name, that tweet is directed straight to them and is not sent to your followers Twitter feed. It does show up on your profile, but not to all of your users. If you want to say something about a person and you want your twitter following to see it, include the name of the person anywhere within the tweet, except for the immediate beginning of the tweet. Using the tips above will help you and your brand build stronger relationships with your customers, increase brand awareness, and potentially your sales. They key with Twitter is you want to be as transparent and human as possible. Do not automate responses when people follow you, but tweet at them directly, include their name and potentially a compliment or "thank you" for following you. There are countless stories of people becoming more loyal to brands, simple because the brand responded to them via Twitter. Social media is a powerful tool if you take the time to understand it and leverage its power for the good of your company. If you have any questions or would like advice on your Twitter account, leave me a comment below, or tweet at me @SpeakeasyStrat. If you enjoyed this article or found it helpful, please go ahead and tweet, share, pin, and post it using the buttons below. Started a Twitter Account? Now Let's Maximize Your Tweets. If you have read my earlier post and you are here, you have decided to start a Twitter account for your business. Signing up the just the start. Anyone can follow the steps to start an account, but it is another story be able to make your tweets work for you right away. But, using Twitter effectively can be taught and learned over time. The following infographic from Fuse Work Studio gives some great insights on how to maximize your tweets for your business and efficiently use your time and money. Instead, it creates a way for your business to reach customers in a new way and increase brand awareness. Look for my upcoming post which will show you what you should be posting as a company and how I leverage Twitter for my business and clients. Feel free to leave a comment with your input on how you want to use Twitter to grow your business. Should You Have a Business Twitter Account? How can Twitter Help Your Business Grow? See what people are saying about your brand online. Interact with your fans and customers. Become an expert in your company's industry. To convince you of the impact of Twitter in the digital marketing world, here are a few stats to convince you to begin a business Twitter account. There are 200 million active users on Twitter. An average of 400 million tweets are sent everyday. It is growing at over 1.123 million accounts per day, meaning more than 13 new accounts per second. 51% of active Twitter users follow companies, brands, or products on social networks. 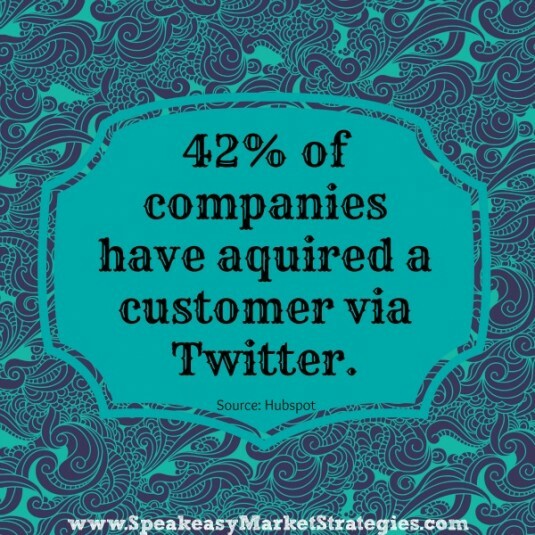 65% of the Fortune 100 use Twitter to communicate with customers and stakeholders. More than half of Twitter users are under the age of 45. Just like every other social media platform, Twitter can be extremely time-consuming. It is one of the core social media platforms and having a well-managed and active account can significantly improve a brand's online presence. As a business, you must evaluate if you can devote time and a budget to your social strategy. There are many examples of companies successfully using Twitter around the globe and even in smaller cities like Tulsa. Look for examples of Twitter success stories later this week, which will prove that no matter how small the business, you can make a splash online with Twitter. For those of you with questions about Twitter for business, feel free to leave a comment below with your question and I will promptly respond.